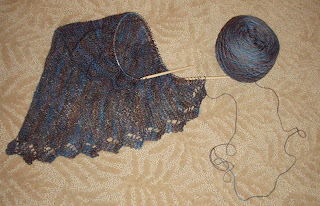 I just finished the first panel of Lorna's Lace Shawl (the pattern comes free attached to the hank of yarn). I bought this yarn at Alamitos Bay Yarn Co. a few weeks ago, and I'm slowly tackling this project. It's literally as thin as crochet thread, and I'm surprised that I can do this - BUT I must say in all sincerity that this is EASY stuff - the entire pattern consists of casting on, knitting, turning (not wrap and turn; just turn! ), yarn over, and bind off... if you can do those things, along with moving a marker, I am confident you can do this pattern. I did make a spreadsheet for this pattern because you follow the pattern so many times for each panel - I find that if I make a checklist or matrix to check off with each box, it's a lot easier for me to keep track of my rows, etc. I don't have an easy time remembering what row I'm on - I literally must check a box after the completion of each row. I also have been working on a baby sweater for someone special - it's not quite finished yet - but it's turning out very cute! I did my "make 1" stitches a little differently than I think I was supposed to for the collar, and it made tiny holes across the top and bottom of it, but I like the holes, so I kept it. They look neat to me (kind of like eyelets!) - I will talk with my knitting gals to find out how I should have made my "make 1" so that next time I will know what I did wrong! scrap scarf that I started forever ago - maybe 50% complete - this will probably never be worn - I thought it'd be a good idea but I don't like the way it looks but it just looks silly. I should just finish it and bind off and be done with it - so it's at least not on my list any more! "circle" intarsia/fair isle scarf - maybe 10% complete (kind of complex for me) This one will take a while! - I need to pack it all together so that all the yarn and pattern are in one place. Of course, I want to cast on my Quiviuk hat, and another 2 or 3 sweaters are itching to get started... I need to focus on finishing some of these pieces - the reason I don't get stuff "done" is because I'm spreading my precious knitting time across too many projects! Right now, I'm working on the lace shawl, the baby sweater AND the Phoenix sweater... so my stitches are spread out. The other comment I want to make is I am trying to find a book or form or computer program (mac preferably) to keep track of my knitting projects. If anyone knows of a good form or program, email me or post a comment - I want to try to record when I made my projects, for whom, and have a place to remember the yarns, patterns, etc. - in 50 years I might want to look back and see what I was doing. The blog helps keep track of some of it, but I would prefer a different format.